YET ANOTHER village in Maharashtra is facing the brunt of the forest department’s refusal to recognise gram sabha’s decision-making rights under Community Forest Rights (CFR) claim. CFR is a provision under the Forest Rights Act that empowers a village gram sabha to manage its forests. The residents of Pachgaon village in Chandrapur district, who felled some bamboo clumps last year after deciding it at the gram sabha, are being bullied by the forest department to admit that they are at a fault. At an arbitration meeting on May 8, 2014, before the Chandrapur district collector, forest department officials insisted the residents committed a crime and that they should return the bamboos or pay a fine equivalent to their value. The residents have now been asked to frame a response to the allegations. The residents say they plan to contest the demand of the forest officials. A day before the arbitration, forest department officials tried to seize the felled bamboos in the village. They stopped after district collector Deepak Mhaisekar intervened. The forest officials claim the residents violated the forest working plan by destroying bamboo clumps during bamboo felling in CFR area, but residents say the bamboo felling was essential as there were too many bamboo bushes in the area. Bamboo bushes ideally need to be thinned every three years and the bamboo bushes that bear flowers need to be felled to allow regeneration. Pachgaon resident Mahadeo Tekam says the village received CFR claim in 2012, and in December 2013, the gram sabha decided to undertake bamboo felling on a 15 ha stretch of forest where felling had not been done in 25 years. “The bamboo stretch had become very dense and congested, so we decided to remove some bamboo clumps altogether, leaving a minimum distance of three metres between the clumps to facilitate regeneration,” says Tekam. Residents say 76,000 long-bamboos were felled, out of which 35,600 bamboos have been sold. They allege the problem with the forest department started last December when the local Chief Conservator of Forests (CCF), Sanjay Thakre, wanted to carry out an inspection of the forest. They say Thakre got upset when he was asked to make an entry in the register maintained by the gram sabha to monitor the people going into the village forest. “He told us that the forest belonged to the department and that he did not need to follow any rules,” says resident Gajanan Thamke. After his visit, Thakre registered a case of forest offence against the village for removing the bamboo clumps. “Of the 3,607 bamboo clumps in the area, 1,060 were completely removed by the villagers which is a violation of bamboo felling norms,” says Gajanan Hire, deputy conservator of forests. The seizing operation, he says, was undertaken on an order of the CCF issued on May 6, 2014. While Hire maintains the residents should not have destroyed the bamboo clumps, he admits felling had not been carried out in the forest for a long time because the stretch was not included in the bamboo working circles under the current working plan. Residents say that they are fully aware that silvicultural practices prohibit removal of bamboo clumps, but it had to be done because the forest department had failed to carry out regular felling and thinning of the clumps, which is necessary for regeneration. Thamke says the forest department has stopped issuing fresh transit passbooks to the residents for transporting the bamboos because of the alleged offence. “We are not able to sell our remaining bamboo, which is holding up much needed income for the villagers,” says he. 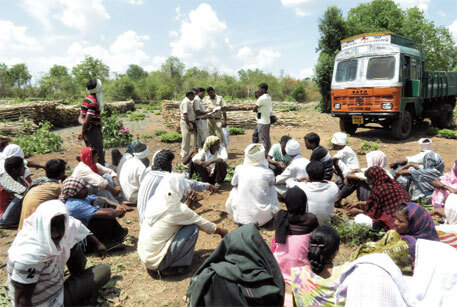 Pachgaon residents depend on forest produce for livelihood. Mhaisekar told Down To Earth that the matter will be sorted out soon and that it will not hamper the process of issuing CFR claims in the district. Chandrapur has only seven to eight CFR claims, which is substantially lower than that of neighbouring tribal districts such as Gadchiroli and Gondia.